Sao Tome and Principe is a small island nation off the coast of Gabon in Africa. It consists of the two islands, of Sao Tome, and Principe. Originally uninhabited, it was discovered by the Portuguese. Principe was settled in the 1493, and Sao Tome in 1500. It was difficult to entice settlers to the islands, so "Undesirables" where sent, mainly Jews. The islands soon became important for the cultivation of sugar, and for trade with mainland Africa. However, as sugar declined, the islands became an important transit point for the slave trade, and eventually, for coffee and cocoa where the soil proved ideal. By the 1950's, the demand for independence was spreading round Africa, and spread to Sao Tome and Prinicipe. The Movement for the Liberation of Sao Tome and Principe was formed, and began to gain momentum during the 1960's. In 1974, the Caetano dictatorship of Portugal was overthrown, and the MLSTP met with the new Portugal government, and began to negotiate with them for Sao Tome's independence. With a brief transitional government, Sao Tome and Principe gained its independence in 1975, with a one-party state. Finally holding multi-party elections in the 1990's. The flag used towards the end of Portugal's time as the colonial power, was the Portuguese flag, with the coat of arms of the islands placed on the fly. Sao Tome has been relatively settled with only 1 coup, and rumours of a second in in 2009. But apparently, it failed. During the transitional government, there where many proposals for a new flag of the new nation. The first idea saw a horizontal bicolour flag of yellow and green, with 2 red stars laid along the centre of the flag. Taking the pan-African colours of yellow, green, and red. The 2 stars represent the 2 islands of Sao Tome, and Principe. This flag, however, they believed, did not represent the struggle for independence well enough, and so, the stars where changed to black, and a red stripe running vertically along the hoist of the flag was added. There was a belief that the vertical stripe did not represent equality and unity, so it was changed to be a red triangle. However, there was a desire to represent Africa better, so the two black stars where removed, and the triangle was changed to black. There was a single red star placed on the black triangle. However, the fact that the 2 stars where black, it was felt, helped represent the 2 islands, and Africa together. So, the flag had yet another twist to it, which led to a horizontal quad colour stripe. with the yellow and green stripes being bound top and bottom with red stripes. The two black stars where then laid along the centre of the flag. This flag, however, was similar to flags used by Indian revolutionaries, so the flag was altered a little, with the flag being switched from going horizontal to running diagonally from lower hoist, to upper fly. However, it was felt it was still too close to various revolutionary flags, so the flag was simplified, with the central stripe being switched from yellow and green, to plain red. The area next to the hoist was yellow, and the area next to the fly was green. The black stars laid along the red stripe. However, it left the green and red touching, which is against heraldic rules. So, the yellow area was switched to black, and the central red stripe was fimbriated with the yellow, keeping the dark colours apart. Finally, the national flag that is in use today was created and adopted on the 5th of November, 1975. 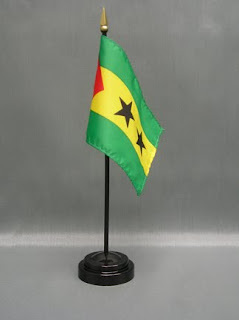 The flag was a horizontal tricolour of green, yellow, and green, with 2 black stars in the central yellow stripe. A red triangle is placed on the hoist of the flag representing the nations struggle for independence.